Published first in 1972, “Dr. Atkins’ Diet Revolution” introduced a new way of losing weight by restricting carbohydrates in the diet. Based on the idea that consuming a diet high in carbohydrates causes the body to store fat, Dr. Robert Atkins suggested a four-phase plan of carbohydrate restriction designed to promote weight loss and to maintain an optimum weight for life. Although the Atkins diet may help you lose weight, MayoClinic.com advises that it is a commercial diet, not a medical diet. Consult your doctor before starting any new diet. 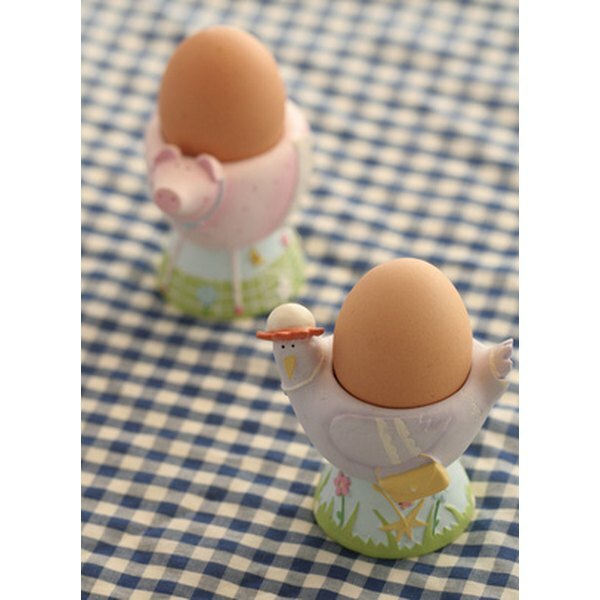 Eggs are popular on the Atkins diet, because a single egg has only 0.6 g of carbohydrates. Dairy products vary in carbohydrate content, with heavy whipping cream containing 0.8 g of carbs in 2 tbsp. and half-and-half weighing in at 1 g for the same amount. A cup of whole milk has 11.4 g of carbs, slightly less than a cup of skim milk, with 11.7. Sour cream contains 1.2 g of carbs per 2-tbsp. serving. Real butter has no carbohydrates. Red meat, chicken and turkey, which are staples in the Atkins diet, contain no carbohydrates. Processed meats may contain carbs, however, because of added ingredients. Three ounces of salami contains 2.4 g of carbohydrates. Although fish, shrimp and squid have no carbohydrates, some seafood does. Six ounces of scallops contains 3.9 g of carbs, and 6 oz. of lobster has 2.2. The same amount of canned clams has 9.7 g of carbs, and oysters weigh in with 12.5. Only a handful of fruits qualify for a low-carbohydrate status, because many contain natural sugar, which boosts their carb counts. A fresh apricot has 3.9 g of carbs, and 1/4 cup of blueberries has 5.1. The same amount of strawberries has 2.7 g of carbohydrates. A tablespoon of lemon juice has 1.3 g of carbs. Vegetables are healthy low-carb food choices, including 1/2 cup of cabbage with 1.9 g of carbs. The same amount of broccoli has 3.9 g, and asparagus has 3.8. Celery contains 1.5 g of carbohydrates in a 1/2-cup serving, while lettuce has 1.3, eggplant has 3.3 and a half cup of cucumber contains 2.5 g of carbs. Most breads, grains and cereals are restricted on the Atkins diet because they are high in carbohydrates, although dieters in the last two phases of Atkins may eat more carbs than dieters in the first two phases. A cup of unsweetened puffed wheat cereal contains 11.1 g of carbs, and a single corn tortilla has 12.1 g. One slice of whole-grain bread has 11.8 g of carbohydrates, and 1/2 cup of cooked oatmeal has 12.6. Biscuits, bagels, muffins and crackers all have more than 20 g of carbohydrates per serving and are restricted on the Atkins diet. Two tablespoons of walnuts contains 1.7 g of carbohydrates. Other nuts have various carb counts, with pecans weighing in at 2.1 g per 2-tbsp. serving, almonds at 3.6, pine nuts with 2.4 and peanuts at 3.4. Unsweetened peanut butter, however, is higher in carbs, with 6.9 g of carbohydrates in 2 tbsp. Olive oil and other pure vegetable oils contain no carbohydrates, and real mayonnaise contains only 0.1 g of carbs per serving. Commercial salad dressings vary because of added ingredients. Caesar salad dressing has 0.6 g of carbs, while Italian dressing has 3 g.
MayoClinic.com: Atkins Diet: What’s Behind the Claims?